Mammalian target of rapamycin (mTOR) is a protein that regulates vital cell growth processes in a living organism. mTOR acts as a communication command centre in human body by receiving external signals from growth factors, hormones, proteins and transfer the signal to on' or 'off' mode for the cell to grow and divide. Globally, Development of efficient and advance technology and growing demand of end user industry, Growing demand for mTOR Inhibitorss demand in end-use industries. In addition,Increase in adoption of mTOR Inhibitors for newer applications increases growth of mTOR Inhibitors Market. However, higher cost of the research and development, and higher cost of interventional devices and popularity of health care infrastructure are the key restraints for global Nanocapsules market. Geographically North America dominated global mTOR Inhibitors market, and Asia Pacific is projected to have fastest growth, owing to highest number of diagnosis cases performed with respect to various cancer (lung cancer, prostate cancer, breast cancer and cervical cancer). Among all the product type, rampamune has the highest market share in global mTOR Inhibitors market. This report identifies the global mTOR Inhibitors market size in for the year 2014-2016, and forecast of the same for year 2021. 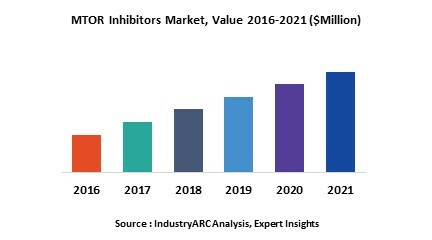 It also highlights the potential growth opportunities in the coming years, while also reviewing the market drivers, restraints, growth indicators, challenges, market dynamics, competitive landscape, and other key aspects with respect to global mTOR Inhibitors market. This report identifies all the major companies operating in the mTOR Inhibitors market.